I LOVE me some exotic flavors… and Thai happens to be one of my favorites. Although I love each dish when I visit a Thai restaurant, I have no heritage or influence in my life; therefore, I have no “natural instinct” on how to make Thai recipes from scratch. Sure, I have tried some of the dressings and sauces they sell at the market, but being a clean-eating type of girl, I prefer to avoid all the preservatives and sodium from those pre-packaged options. Well, I have to say, I found an AMAZING homemade Thai dressing that can make any salad come to life!! And here I share it along side a salad that is loaded with detoxing properties that can make your skin glow! WIN-WIN! For healthy skin, the key is regularly consuming foods that support the proper elimination on toxins (i.e. foods that support the liver and kidneys), along with super-hydrating foods to wash the toxins out and keep the skin supple. 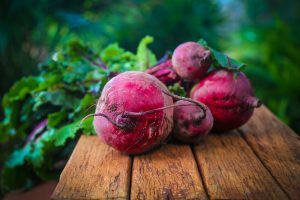 Beets, parsley, and cilantro from this salad provide amazing support to the liver while the water-filled cucumber and green apple supply an abundance of hydration. It’s definitely a new favorite of mine. The salad and dressing are easy to make. Not only is it loaded with flavor, but it’s also so beautiful!! It livens up the table when entertaining guests too! 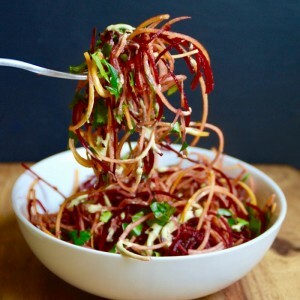 What a refreshing alternative to a traditional coleslaw- I usually bring broccoli slaw to my gatherings, and from now on, this Thai Salad is going to be my go-to. Hope you enjoy it too! Please comment and let me know what you think, what modifications you make (if any), and how much your dinner guests enjoy it!